Can a leak actually help sales? 3 days ago, one of the most anticipated albums of 2010 leaked onto the net. Renowned for his hatred of leaks within his company, Kanye West’s new record may well have leaked at just the right time. 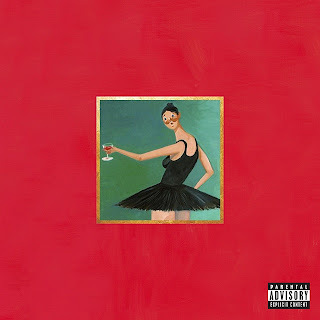 Without going into details (I plan on reviewing the album in full next month) My Beautiful Dark Twisted Fantasy is the artists best work to date. This fact alone has made the buzz surrounding his 5th album rocket sky high following the leak. In the past three days alone, the album has been named a contender for album of the year by multiple credible reviewers, including a glowing (and rare) 5* review from Rolling Stone. The kind of praise being given to Ye’s latest is the sort of hype that artists dream of, making sure the album debuts extremely well on its 22nd November Release date. It helps that the leaked version was the clean version too, the full effect of songs like Monster and the closing monologue from Chris Rock on album highlight Blame Game not being shown until the advisory version is released in stores. I put my preorder in as soon as my first listen ended, the DVD of his incredible short film Runaway sealing the deal. I have never heard an album like My Beautiful Dark Twisted Fantasy, and though it’s hard to predict sales right now, this is an amazing record. It’s rare for a good album to suffer from a leak, so I expect great things once November comes to a close. Tags: Kanye West, My Beautiful Dark Twisted Fantasy. Bookmark the permalink.